Again, North Carolina fell behind early, but this time the comeback was steady as opposed to frantic. Nursing a four point lead with under a minute to play it looked like a trip to Newark was easily in hand when cool-handed freshman Harrison Barnes missed a point-blank shot and then, following another game changing defensive stop, freshman Kendal Marshall missed the front end of a one-and-one. The miscues by the two rapidly rising Tar Heel stars set off a chain of events that led to a head-scratching victory and North Carolina’s record 24th trip to the Sweet Sixteen. 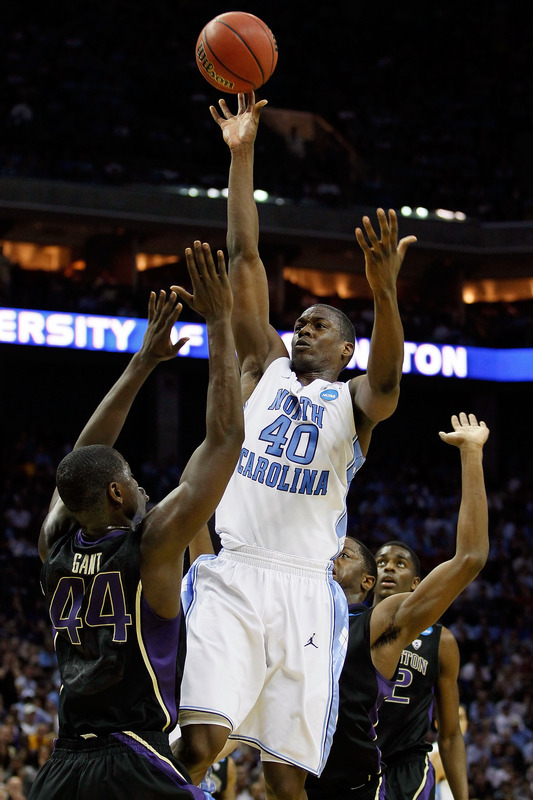 Tyler Zeller scored 23 points, Harrison Barnes added 22 and North Carolina survived a frantic finish to beat Washington on Sunday in the East region to advance to the second weekend of the NCAA tournament. Rallying from deficits of 11 points in the first half and five in the second, the second-seeded Tar Heels (28-7) went ahead for good on Barnes’ three-pointer with 4:06 left. But they needed two free throws from Dexter Strickland and a defensive stop in the closing seconds to advance. Terrence Ross scored 19 points and Matthew Bryan-Amaning added 14 for the seventh-seeded Huskies (24-11), who overcame a hostile crowd to nearly pull the upset in a fast-paced game full of entertaining plays and mental miscues down the stretch. Washington got within 84-83 on Ross’ 3-pointer with 17.3 seconds left, and Marshall missed the front end of a one-and-one. Venoy Overton then missed a runner in the lane, but the ball bounced off North Carolina and out of bounds with 7.4 seconds left. Following the timeout, 6-foot-10 John Henson knocked away the inbounds pass under the basket and the ball landed in Strickland’s hands. touched the ball and gave the Huskies yet another chance. Replays with the official game clock superimposed on the screen showed there should have been 1.1 or 1.2 seconds to go, giving Washington more time for a final shot. Coach Lorenzo Romar said after the game that his staff asked the referees to review how much time should have been left, but the officials stuck with half a second. call—not that it would have mattered. It turned out that Thomas had his foot on the 3-point line. Two years removed from a national championship, North Carolina won its 25th straight NCAA tournament game in its home state a year after being relegated to the NIT.